← Running from the Weather. If you wish to cross the Nullarbor it can be covered anywhere from a couple of days to a couple of weeks. Knowing what to look for and do is key to your journey and we probably didn’t know as much as we could have before we began. I’m not sure but since we crossed we have found out little places we maybe should have smelt those roses. Knowledge and time is what you need as we have sometimes discovered along this journey of ours. Either way we were happy with what we saw and did. This is my recollection of our time across the Nullarbor, the people we met who helped define our time on this road and the places we visited or stayed. The weather was in our favour to begin our journey across the plains. From Kalgoorlie we headed down to Coolgardie then Norseman where we stopped for some lunch by the roadside. We had it on good advice from Nerida, Murray’s sister, that Fraser Range Station was a lovely stopover therefore we made our way there and booked in for a couple of nights. We needed to cook up some meals and use our vegetables before the checkpoint at Ceduna. Our campsite was private and spacious at the Station, the weather was good enough for now to not need the awning up and we managed to cook our meals for the next few nights which makes it easier if rain does happen. The Station had a wonderful camp kitchen with plenty of room for everyone, a warm fire to sit by which we made use of each night rather than sitting outside in the cold night air, as did many other travellers. The campfire area was also great to meet up with all the neighbours around us for happy hour. We had lots of animal neighbours here as well, with emus and kangaroos roaming around freely and peacefully near the campsites and on the open plains. There were some pretty walks around the Station which we enjoyed and Mack the Station dog joined us on these walks, the views were spectacular across the camps from the hilltops. I picked myself up a new vest here as I needed a second one and some souvenirs in the little shop/office. With plenty of beautiful birdlife and gardens to relax in this place was great to have our two night break. Our next destination for the 05/08, after talking to many people at the Station and receiving much helpful advice, was Moodini Bluff, a free camp with good toilets, plenty of spread out campsites with little fire pits. We lit our fire, heated our dinner of lamb Rogan Josh and sat under the stars enjoying a quiet chat and each other’s company. It drizzled a little bit but didn’t spoil our fun. 06/08 we drove on to Mundrabilla Roadhouse for a warm drink and a stretch of the legs, then onto Eucla. Just outside this little town we were stopped for a random breath test by a young policeman, who was only to happy to have a chat while he checked everything over. Apparently they were after some stolen vehicles. There were many bikers on the road with side cars and plenty of gear in them. Murray chatted with a few in Eucla and found out they were on a 40th anniversary border rally being held over the weekend. We crossed the border into South Australia on this day, our fourth Border, two to go. The temperatures rose to 26 as we pulled into the first point of interest, of which there are four along the Nullarbor, Bunda Cliffs. Spectacular colours and sheer drops of cliffs into the water. Under the blue skies of a clear day these cliffs shone in all their beauty. Each point of interest was certainly different and we hoped for the next one to display the wildlife we were waiting to see. Whales. Head of the Bight, pay the $15 each and do the walk down to the observation areas and you will not be disappointed at all. Around fifty whales were in the area and it wasn’t early in the day, after 4pm, stay and watch to see the display of mums and bubs playing, be patient and you’ll see others flipping out of the water and putting on a brilliant display with flippers waving and tails slapping. One little white baby was with its mother and having a lovely time in the late afternoon sun. These mammals were really putting on wonderful displays for us as we watched and clicked away on the camera. Five o’clock approached quickly and we had to leave but we were very satisfied with what we had witnessed. Whale, whales and more whales. Magnificent. We returned to the entry gate where there was a free camp called the Whitewell, an old Waterwell in its day, and set up for the night with one other couple in a van, Stewart and Kay from Albury, for company. What a day we had spent on the Nullarbor. Tomorrow would be our last day across these plains. 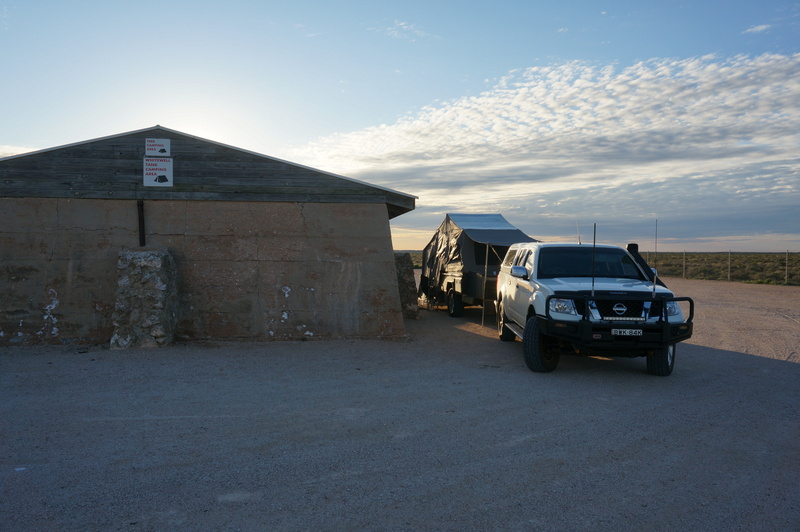 On a recommendation from some people we met at Fraser Range, Brian and Margaret, we spent our second last night on the Nullarbor, 07/08, at Coorabie Farm, near Fowler’s Bay, where the owners Poggy and wife Deb greeted us with open arms and friendly hospitality. These two not only came and had happy hour but spent their meal times with us all as well, in the camp kitchen. Brian and Margaret were staying here too. We went on lovely walks out of the station and within it, checking out all the wombat holes around the fields and the old machinery. We had a very protected site with power, clean and roomy ammenities and can highly recommend this place. 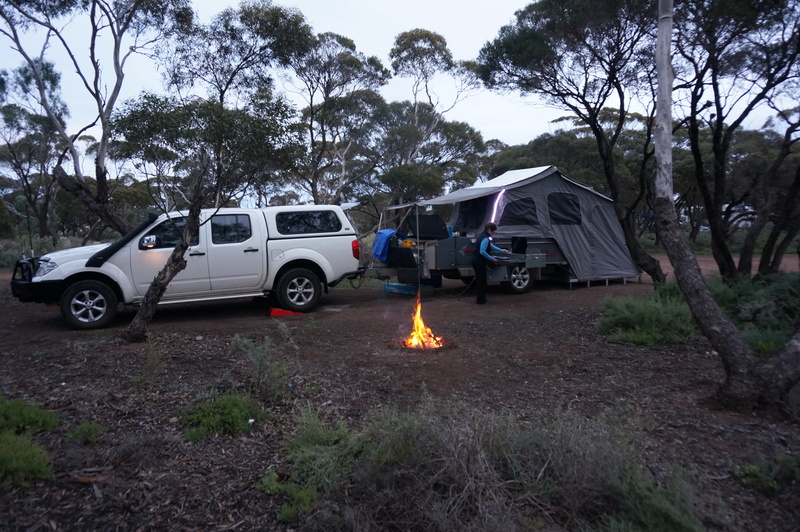 Haslam Council Camp, $5 honesty box, was our last night on the Nullarbor. This is a tiny town just past Ceduna and Smoky Bay but before Streaky Bay. There isn’t much here, a block of toilets for camp use, a few houses, small post office which isn’t manned regularly and a jetty to fish from with a lot of people catching squids. We did some shell collecting and witnessed a pod of six dolphins playing just off the end of the jetty. That night we had a campfire with our neighbours Sue and Tony and were also joined by John and Helen, Ross and Sue. The weather had turned for the worst again becoming wet and very windy as we headed toward Streaky Bay but it was too wet to enjoy the coast. Morning tea was at a little bakery in a pretty coastal town of Elliston and then we drove to Whyalla where we booked a cabin for the night out of the high winds and rains that were now hitting hard. Deb was the manager of the Whyalla Caravan Park and she couldn’t have been more helpful for us giving us a fully self contained unit which had been recently refurbished and a $9 discount, only charging us $81. Warm, showered and fed we slept well and were looking forward to our trip to the Flinder’s Ranges the next day. This entry was posted in Adventure, Challenges., everything, Life, New People, South Australia, Travel. Bookmark the permalink. 2 Responses to The Nullarbor and Beyond. Loved the photos of the whales. It looks rather deserted out there. Craig went caving on the Nullarbor 35 years ago. Did you see or hear about the caves?